Now you’ve been very patient, waiting for me to test that plum sauce and see whether it works with savory foods. The good news is that a) it does and it is superb and b) you get an extra recipe for plums which cropped up in the process! I served the following plum sauce over pork served with braised apples and red cabbage, and boiled potatoes. My children couldn’t get enough of it which should give you the heads up. It has the advantage that it is much more health conscious compared to the better known plum sauce from Asian kitchens. Cook the plums covered on low heat in dry white wine and vinegar. Once the plums are soft, allow to cool and press through a strainer. Place the plum liquid into a clean cooking pot and add honey. Allow to cook on low heat uncovered until the volume of the sauce has reduced by half. Serve warm or cold over pork, potatoes or other. 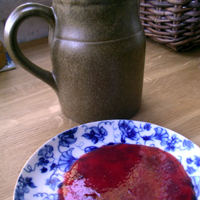 Combine all jam ingredients in a pot and blend with a wooden spoon, cover and cook over low heat. Once the sugar has dissolved and the jam is gently bubbling, remove from heat and skim away the ‘foam’ at the surface of the jam. Blend the natrium bensoate in a spoon or two of jam and add to the pot, blending thoroughly. Remove the cinnamon sticks. Pot the jam immediately. The plum trees in my garden have decided that this is their year! Standing on the ‘inside’ of a plum tree next to the trunk with the branches curving in like an igloo all around you is quite an experience. Everywhere I look the rich fruit pours down and I wonder whether I have gone to heaven. Fortunately, not yet…I’m quite alive so far and have been thinking about all of the many fine recipes I can prepare with these beauties. First, to encourage you to enjoy plums, here’s the nutritional scoop on them. Plums are giving blueberries competition when it comes to antioxidant value (antioxidants fight free radicals associated with cancer and heart disease). In difficult economic times they could even be a preferable choice since a single plum can give you just as effective an antioxidant boost as a handful of more expensive blueberries. 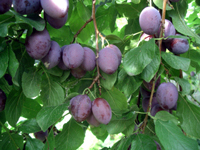 Plums are also famous for their beneficial effects in encouraging good digestion due to a substance under the skin. Apart from eating them just as they are, sweet and delicious, this season, it is hard to resist making a sweet dessert with them. Here is my recipe for plums under a blanket which suits the cooling weather of September and isn’t too dangerous for your wasteline in delicate quantities. Preheat the oven to 125 C or 257 F.
Rinse the plums and pat dry. Cut in half, remove the pit and place in a cooking pot. Add sugar and cinnamon and cook on medium heat for up to five minutes so that the sugar blends into the fruit. Remove from heat. Combine the dry ingredients for the blanket in a food processor and add butter cut into chunks, egg and milk. Blend until an even batter. 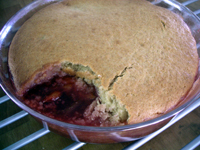 Place plums in an oven-proof dish and cover with the batter. Bake 30-40 minutes and serve warm. Of course, a dollop of cream is nice but not necessary. I’ll be exploring making a savory plum sauce this evening. If it’s successful, watch this space! Until then, check the Nordic Wellbeing Cookbook.